With the plethora of print and on-line publications that tout themselves as the be all and end all of college basketball, there is one publication that stands head and shoulders above the rest. 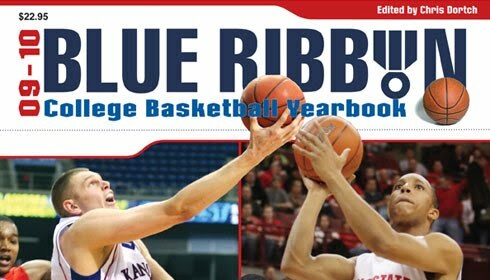 That is the annual Blue Ribbon College Basketball Yearbook. The 2009 - 2010 publication is now on the streets. Edited by Chris Dortch and printed by Blue Ribbon Sports Media Group of Chattanooga, Tenn., Blue Ribbon—long known as the “Bible” of college basketball—gives its readers the most thorough, upto-date and timely evaluations of every Division I team in the country. That commitment to full coverage of college basketball has caught on with people who make their living coaching, scouting or reporting about the game. Go in the office of nearly any Division I staff in the country, from Duke to UCLA to Winthrop, and find on any assistant or head coach’s shelf a backlog of at least 10 Blue Ribbons. NBA scouts clamor to get the book to assist them in their evaluation process. Look in any college basketball play-by-play announcer’s briefcase and you’ll likely find a dog-eared, yellow-highlighted copy of Blue Ribbon. Many long-time sports writers who cover the game believe Blue Ribbon is an indispensable textbook to draw on throughout the season. And CBS and ESPN, the two television networks that cover the most college basketball, always equip their on- and off-air personnel with a copy of Blue Ribbon. The only downside is that you will not find it at Barnes & Noble, as it is only being sold at Borders, and at Books-a-Million stores in 21 states (Our Books-A-Million in Athens closed some years ago). It can, however, be ordered by mail (Blue Ribbon Yearbook, 3721 Powers Court, Chattanooga, TN 37416), at www.blueribbonyearbookonline.com or toll-free at 1-877-807-4857. Blue Ribbon can also be followed on Facebook and Twitter. Here is a YouTube video from EA Sports with coaches talking about the publication.